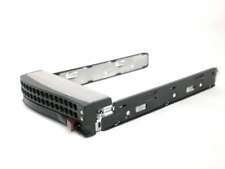 Supermicro MCP-220-00075-0B/MCP-220-00024-0B Gen 5.5 Hot-Swap 3.5" HDD Tray Caddies. 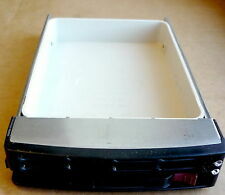 This is a used, clean,LOT OF 12, Supermicro 3.5" SAS/SATA Server Hard Drive Trays/Caddies. Supermicro Part #. No power cord or AC adapter included. (See Pic carefully When You Action). Unit shows light scratching and signs of wear device wide. The pictures include everything that you will get. SuperMicro 3.5" Hot-Swap Caddy. 0092-0B with Tray. History New hard drive trays. Notes Pulled from SuperChassis 745TQ-R920B. 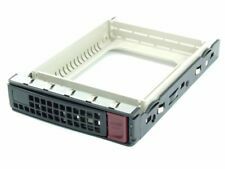 • (434) - SUPERMICRO SC93301 HOT SWAP HARD DRIVE CADDY TRAY SLED 3.5' SC847E26 LFF SERVER. 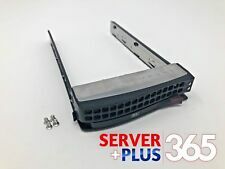 • (160) - SUPERMICRO SC813A2 HOT SWAP HARD DRIVE CADDY TRAY SLED 3.5' SERVER. We allow local pick up. The item is sold AS-IS Where is. Pictures are a representation of what you will receive with identical or similar condition. Light scratches and scuffs from typical use, but very clean overall. All the information we have about this item is listed in the ad. We do not warrant the accuracy of this information as we are not the author. We’ll resolve the issue and make it right. Pulled from Supermicro SuperServer 6040. Application:3.5" Hard Drive Carrier / 3.5" HDD Tray / 3.5" Hard Drive Caddy. Manufacturer:Not Specified. Condition: New open box! Part number: 05-SC82708-XX00C104. Supermicro Supermicro Drive Tray for 847D. Manufacturer Supermicro. Part Number MCP-280-00024-ON. Check parts for our serial numbers before sending back. Our servers and parts are tested for full functions, R2/Ready for Reuse. 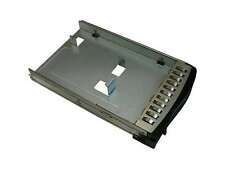 Supermicro Supermicro Drive Tray for 847D. Manufacturer Supermicro. Part Number MCP-280-00030-ON. Check parts for our serial numbers before sending back. Our servers and parts are tested for full functions, R2/Ready for Reuse.